Goatskin leather palm and thumb construction with 3mm EVA palm pad. 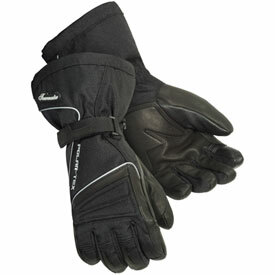 600 denier polyester upper, padded articulating hinge design and accordion stretch knuckles. 100g 3M™ Thinsulate® Flex insulation. Leather throttle guard between the thumb and index finger. Touchscreen compatible conductive overlays on the thumb and index finger. Reflective piping for increased nighttime visibility. Gauntlet cuff, hook and loop closures, and elasticized wrist bands.